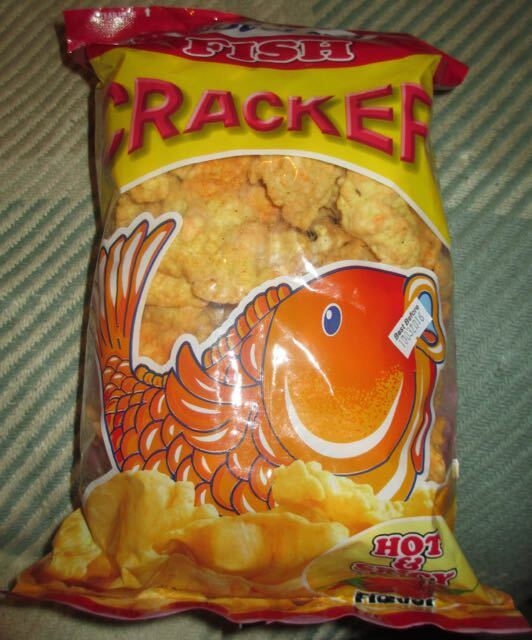 I bought these Golden Fish Cracker Hot & Spicy flavour from one of my favourite import food haunts in Birmingham. Produced by the Narita Snack Food Corporation in Manila, which is the capital city of the Philippines, these crackers have a two chilli rating on the 200g bag. I usually ignore serving size suggestions, and at 40g it did seem reasonable, and even though I’m a bit of a gym freak at the moment, I still didn’t figure I could or should eat all 200g in one sitting. I’m not much of a sharer either, selfish I know, but hey… A guy’s gotta eat! However, if I don’t like something the greedy and pride sides of my bad nature are generally quickly overridden and I will readily pass them around (I know, what a generous soul!). Besides, if I don’t like these Golden Fish Cracker Hot & Spicy at least I’ve had an educational reminder that the capital city of the Philippines is Manila for when I’m playing Pointless on the TV from my armchair! On opening the packet these reddish oddly shaped crackers emitted a decent fishy smell. They are very crunchy indeed, so if you buy these get your best gnashers ready. There is a fishy flavour throughout the crunchiness with a mild spice and saltiness. I wouldn’t say these crackers were Hot & Spicy though, but they are strangely moreish. After delving deeper into the packet I found a few crackers that were fish shaped, which made me feel better about the really bent and broken ones. I also noticed that the more I ate of these Golden Fish Crackers the gentle spice crept up on me leaving a pleasing chilli burn in my mouth and made my nose run a little. Maybe these are Hot & Spicy? You just have to dig a little deeper. I don’t think you’d go far wrong sharing these out at a party though, well, if you’re that way inclined! Ingredients included; wheat flour, cassava flour, baking soda, salt, monosodium glutamate, fish flavour, hot & spicy seasoning, natural spices, citric acid, natural flavours and colours.